This document was created using Docutils/reStructuredText and S5. It is the introductory Python course given by Parse.ly to the newest generation of Python hackers. Me: I've been using Python for 10 years. I use Python full-time, and have for the last 3 years. I'm the co-founder/CTO of Parse.ly, a tech startup in the digital media space. It's embedded in the heart of the language. Watch out for the increasing human cost of a project as time goes on! Didier is a Parse.ly cofounder and my favorite Python engineer on the planet. My choices at the time were Java (the Eclipse-driven language), C (a language of last resort), C++ (a language that comes with reference book), Perl (a Babylonian language), and Matlab (closed source). At the time, I was done with computer science and I needed a language that I could use for prototyping, like Matlab was, but more general. My job is easy because Python was built as a teaching language. I learned Python using an online book called Dive Into Python, by Mark Pilgrim. The concept behind that book is that Python is such a readable language, that we can learn it by reading well-written Python programs. We'll try to use this approach to good effect. Python is an opinionated language, and I have an opinion about code. In this class, you will learn to write opinionated code that has good style. 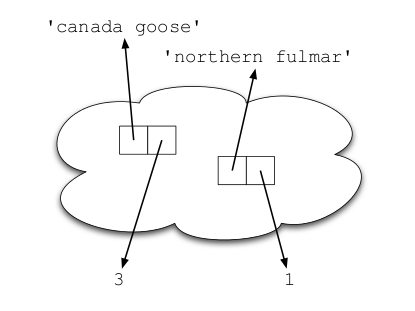 Declares a label called nums, and binds it to a list value. Could just as easily be written this way, although no Pythonista would ever do this. In Java, I have even tapped into some obscure features, using Arrays.asList to initialize the ArrayList, leveraging the fact that arrays, but not lists, have a concise initialization syntax. In Python, lists are declared using [item1, item2, item3, ...], a simple and concise syntax that can be easily read. This is but one example of hundreds made in the language. Iterates over each item in the nums list, yielding a tuple for each iteration step that contains the index of the list value and the list value itself. The for loop has created two new bindings, idx and num, for each iteration step of the loop. These bindings are unpacked from the tuples yielded by the enumerate built-in function. We can break this down by looking at how one step would work. Behind every good Python programmer is a good development environment. One of Python's best features is the REPL loop, or Read, Evaluate, Print Loop. Open source developers have created a number of "enhanced" REPLs over the years. The most common of these is IPython, but there is also BPython and DreamPie. 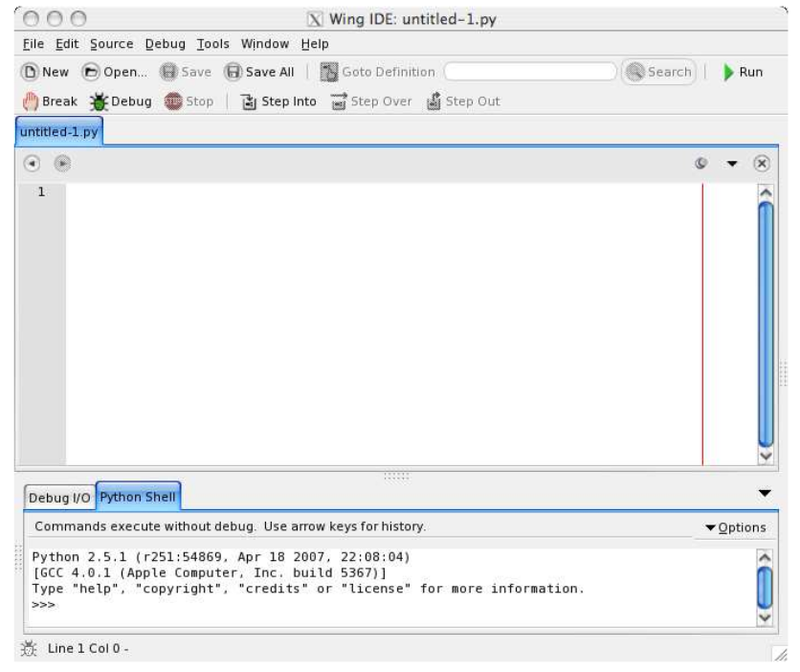 WingIDE has its own REPL that is integrated with the IDE and works in debug mode, as well. 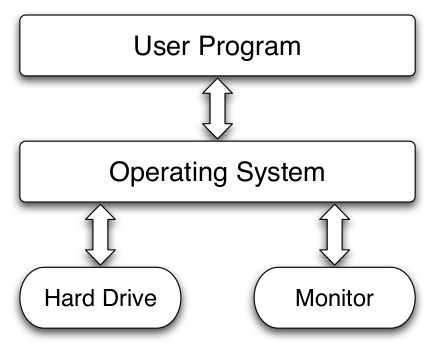 In traditional compiled languages like C/C++, you think about user programs which run directly on the operating system. Python introduces one more layer of abstraction, the Python interpreter, that is like a mini operating system running above the actual operating system. There is no separate "compilation" step like C/C++/Java. You simply run the python command, and you can start evaluating code. The python command, when run with no arguments, opens the interactive shell. When run with arguments, it acts as a runtime for code that can be stored in files or provided at the command line. python -c "print 1 + 2"
Must assign a value to a label before it can be used. No compile-time check that label has already been assigned, so mis-spelled label name raises a NameError exception. This is a common source of bugs. Though labels can be re-assigned among types at will, the actual values behind the labels do have types. And Python does not go out of its way to coerce types that cross "semantic boundaries". This makes Python a dynamic, but strongly typed language. Contrast with Perl, which is both dynamic and weakly typed. "Wait a second. Are you serious? Whitespace is significant in Python?" "Where the hell are my curly braces!?" Short answer: because we do it anyway. Better answer: because some of us don't. Python Style Guide (PEP 8) recommends 4 spaces, and no tab characters. One problem with significant indentation is how to break long statements on multiple lines. With no arguments, the help function opens an interactive help prompt. But usually, you only need help on a specific function or module. So, then you can call help with an argument. >>> print "There are", cars, "available"
Python number literals are either int or float, depending on context. If an expression is a float, IEEE 754 floating point rules apply. Otherwise, normal integer math rules apply. When dealing with non-scientific computations, you probably want to use the Decimal class. It is a little awkward to use -- you must specify your numbers as strings. However, it supports all expected operations directly on the Decimal object. To make it a little easier to use, I imported it using a module alias D.
There are two simple ways to do string formatting in Python, and both are very popular. %, defined on str objects. str.format, a more verbose method available on str. There are many programmers for whom strings play a much more vital role than number types. I am one of those programmers. My applications deal with the web and with large-scale text processing. A core understanding of strings and a language with capabilities to manipulate them is critical to get work done in this environment. In Python, strings can be enclosed with single, double, or triple quotes. breaks. Thus, they can be used as a kind of 'heredoc'.""" 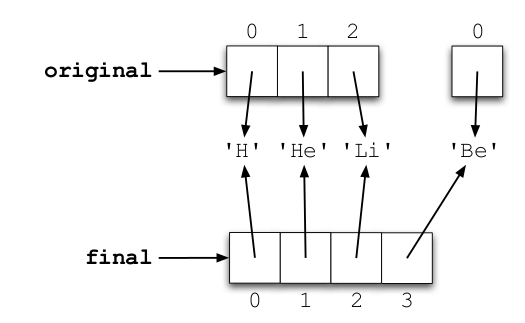 "though single and double are mostly interchangeable,\n triple ..."
They may also be preceded with a special character prefix, indicating a special string mode. Currently, only two are supported: raw strings using prefix r, and unicode strings using prefix u. >>> ". ".join("PYTHON IS GREAT".lower().split()) + "." >>> p + (" %s " % "IS") + g[0:15] + "..."
When methods are chained, the intermediary results of computation are simply discarded. Python automatically imports a slew of functions, types, and symbols, which are known collectively as built-ins. These provide the "basic language constructs" before you start referencing the modules of the standard library. The fact that everything in Python is first-class is often not fully appreciated by new programmers. How would you have written this in Java/C#? Among the imported symbols from __builtins__ are True, False, and None. These core symbols used in boolean logic, and are typically utilized with keywords such as is, not, and, or, etc. >>> y == True # aka, "y is truthy"
>>> x == False # aka, "x is falsy"
>>> y is True # aka, "y is True singleton"
>>> x is False # aka, "x is False singleton"
print "allow login for admin"
print "allow login for user"
Logical operations can be visualized with a truth table. Lists are reference types, which means they simply contain pointers to objects that exist elsewhere. Lists can be altered (mutated) at will, which does not require recreation of the entire list. 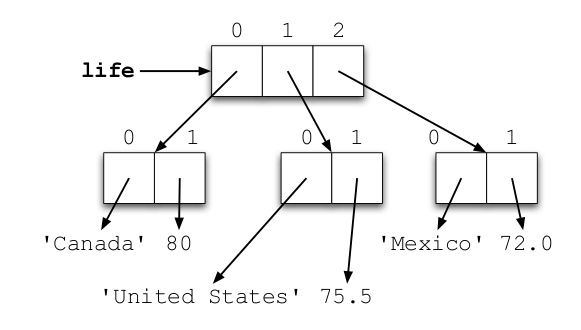 Lists can be concatenated with other lists using extend, which creates a new list but does not require reallocating all the data. Lists have a convenient syntax for accessing single elements or even ranges of elements. This is called slicing and can also be done with the slice builtin function or [i:j:stride] syntax. Lists can be aliased simply by binding a new label to the list. This sometimes leads to bugs! Lists can also be arbitrarily nested, or contain other types altogether like tuples, sets, or dictionaries. Dictionaries contain a "magically stored" set of items, which are key to value mappings. Similarly to dictionaries, sets "magically" store their values. Since sets can only store unique (hashable) values, it will remove duplicates from other collections like lists. Sets also support fast set operations like union, intersection, addition and subtraction. Why provide a less general type of collection? Must use (val,) for one-tuples, due to some grammar ambiguity. (...) overloaded for tuples, function invocation syntax, and operator grouping! Quite a contrast when you compared to this! """Divides operands a and b using integer division. Divides operands a and b using integer division. Logic flows around the function body, then re-enters it upon invocation. The first argument is known as a positional or required argument. The latter 3 are known as keyword or optional arguments. In many languages and communities, the code on the last slide isn't bad. But, in the Python community, it is. does your function really rely on the list type, or does it just need something that is list-like (e.g. a set), namely, that supports iteration? does your function really rely on the file type, or does it just need something that is file-like (e.g. a buffer), namely, that supports reading? This concept, duck typing, is near and dear to many a Pythonista's heart. Though eager checking is a virtue in many communities (e.g. Java), in Python, this is very much looked down upon. Python is built on a different principle known affectionately in the community as EAFTP. That's: "Easier to Ask For Forgiveness Than Permission"
In the code on the last slide, it was like we were walking on eggshells with the value passed to us by the user of the function. The error messages are nice, the code is correct, but the essence of the function is polluted by the excessive checking. Why not just try to do what your function expects? EAFTP is another concept near-and-dear to a Pythonista's heart. The general idea is, rely more on exceptions and exception handling, than on validation and checking. In addition to code cleanliness benefits, this often has performance benefits, too! Since the optional clients argument is associated at declaration-time, the same list instance is shared by all invocations of the function. This is probably not what you want, since on the second call to the function it will have two HTTPClient instances in it. This is even worse if you try to default e.g. empty dictionary, as the bugs may be even more subtle! One of the less pleasant quirks of the language, IMO. assert parts["Scheme"] == "http", "scheme must match"
assert parts["Host"] == "www.linkedin.com", "host must match"
assert parts["Port"] is None, "port must match"
assert parts["Path"] == "/in/andrewmontalenti", "path must match"
Will give more detail and color on the topics we covered today. Python is a dynamic and opinionated language. Day 1 was to learn enough to be dangeorus. Day 2 is to be dangerous. # .. function above .. The first column represents an individual's age and the second column their test score on a standardized test. You want to write a Python module that will process a full file of that data, but the file will be perhaps tens of thousands of records long. """Returns a list of values from the column with index idx.""" This tends not to be necessary; only for larger files. Explanation of that last line will come soon! The organization of your code source files can help or hurt you with code re-use. This is great for experimenting, but you can't re-use this code at all! I think that's a bit better for re-use -- you've made squares flexible and re-usable -- but there are two mechanistic problems. And, second, were it importable, it would execute squares(0, 10) on import - hardly what you want! Namespaces are a great idea! Good, but now if you do import calc_squares, the squares(0, 10) code will still get run! There are a couple of ways to deal with this. 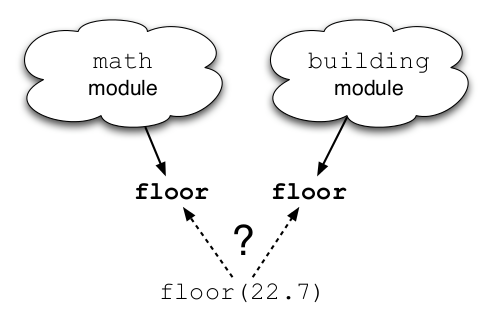 The first is to look at the module name: if it's calc_squares, then the module is being imported, while if it's __main__, then the module is being run as a script. Now, if you run calc_squares.py directly, it will run squares(0, 10); if you import it, it will simply define the squares function and leave it at that. This is probably the most standard way of doing it. I actually prefer a different technique, because of my fondness for testing. (I also think this technique lends itself to reusability, though.) I would actually write two files. Why split our files this way? First, this is eminently reusable code, because squares.py is completely separate from the context-specific call. Second, you can look at the directory listing in an instant and see that squares.py is probably a library, while calc-squares must be a script, because the latter cannot be imported. Third, you can add automated tests to squares.py (as described below), and run them simply by running python squares.py. Fourth, you can add script-specific code such as command-line argument handling to the script, and keep it separate from your data handling and algorithm code. A Python package is a directory full of Python modules containing a special file, __init__.py, that tells Python that the directory is a package. Packages are for collections of library code that are too big to fit into single files, or that have some logical substructure (e.g. a central library along with various utility functions that all interact with the central library). Note that __init__.py is just another Python file; there's nothing special about it except for the name, which tells Python that the directory is a package directory. __init__.py is the only code executed on import, so if you want names and symbols from other modules to be accessible at the package top level, you have to import or create them in __init__.py. you can use them as a library hierarchy. That is, the names of the functions would all be immediately available at the top level of the package, but the implementations would be spread out among the different files and directories. The down side is that everything gets imported all at once, which (especially for large bodies of code) may be slow and memory intensive if you only need a few of the functions. If you wanted to keep the library hierarchy, just leave out the top-level imports. The advantage here is that you only import the names you need. However, you need to remember more. Some people are fond of package trees, but I've found that hierarchies of packages more than two deep are annoying to develop on. You spend a lot of your time browsing around between directories, trying to figure out exactly which function you need to use and what it's named. then only 'some_mod.fn1()' would be available on import. This is a good way to cut down on "namespace pollution" -- the presence of "private" objects and code in imported modules -- which in turn makes introspection useful. This is a common enough pattern that Python has a way to do it automatically. 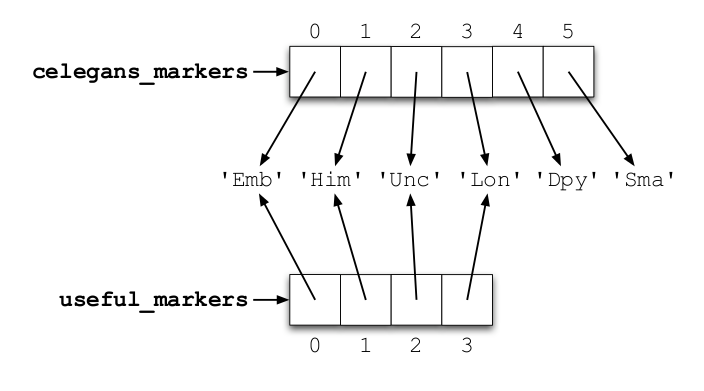 This is one of Python's nicest protocols, called context manager. 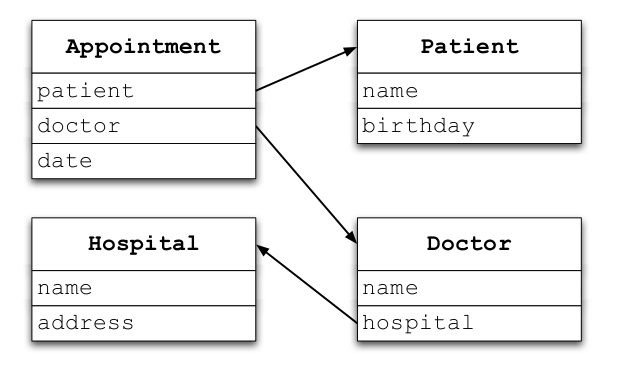 A context manager is any object that implements two special methods, __enter__ and __exit__. Closing files cleanly after processing them. Setting a decimal context / precision for a certain bit of code, and returning it to original state afterwards. Acquiring a lock and releasing it afterwards. The context management protocol is an example of a "Dunder Protocol". Rather than rely on type heirarchies like other languages, Python has a variety of cross-cutting protocols that are implemented using methods with a double-underscore prefix and suffix. These are sometimes referred to as "dunder" methods. It has become popular in some open source projects to make use of dunders for internal names. Imitation is a sincere form of flattery, but this is very much recommended against. The Python maintainers chose dunder because they figured it was a safe place to put internal Python protocols that are not likely to ever conflict with user code. You can have your own .len(), ._len() and .__len() methods, but __len__ is reserved as a protocol with special systemwide meaning. Conversely, many programmers shy away from dunders altogether, thinking that Python maintainers did not intend you to make use of them. Quite to the contrary: many dunders are downright essential for Python programming, e.g. __init__, __repr__ and __hash__. You may have noticed that a lot of Python code looks pretty similar. It's worth a quick skim, and an occasional deeper read for some sections. use lowercase, _-separated names for module and function names, e.g. A regular expression is a powerful domain-specific language for text pattern matching. Python, like most other modern languages, provides standard library support for this powerful tool. + symbol means that any char from that class must occur one or more times. @ character is treated as a literal here. Regular expressions tend to be used for two purposes: validation and partial matching. Validation: if Match object is returned, it passes; if None is returned, it fails. Partial Matching: If Match object is returned, we break the string into groups. Imagine if we needed to refer to the username/domain separately in an email address. Many other programming languages (C++, Java) devote many of their keywords to access control -- think keywords like private, public, and protected. It may be a surprise that Python has none of that. Indeed, most Python programmers take "We're all adults here" to its logical conclusion, and declare that privacy is overrated in programming. Leading underscore on _CACHE, _SIZE_CACHE, and _square make it clear they aren't meant to be used directly. Python programmers don't create singletons, they use modules. Modules can contain functions, classes, values, and, through the package mechanism, other modules. Good module organization == good code organization in Python. Then, a function within a module of the same name! pprint is just another label, it happens to point at a function. lambda is a special keyword for creating simple anonymous functions using a concise syntax. functions don't have to live anywhere in particular; here, we're inserting them into a 2-tuple labeled out_methods. Yes, you just passed a 2-tuple of functions to another function as an argument. Other languages make this needlessly difficult (think Anonymous Inner Classes in Java, or Runnable interface). In Python, no problem. So, you can pass functions around to other functions. Just the same, functions can also return functions. These are sometimes known as higher-order functions. We declare a function that builds functions. that uses a compiled pattern.""" Decorators were meant to make the use of higher-order functions easier in Python. Code like the above used to be common, but now, it can be written more simply. Write a debug_log higher-order function that outputs arguments passed to a function using pprint before entering a function and outputs the return value after leaving. Write a memoize higher-order function that takes a function as its argument and caches all calls to the underlying function using a dictionary. Use the two together for optimizing a fibonacci sequence generator function. Day 2 you became dangerous. Day 3, young grasshopper, you become Pythonic. The for loop is "iteration sugar"
This is the right way to write it. If a class supports __iter__, it is said to be Iterable. The object returned by __iter__ needs to support two methods: __iter__ and next. This object is an Iterator. Think of it like a "cursor" on the sequence, or as a "yielder of values" from the sequence. Python also supports a special syntactic construct that is particularly popular among Pythonistas, known as the iterator expression or list comprehension. These can be very powerful. The above processes and filters a list at once. This may be confusing. What does this do? When you start coding declaratively and operating on large datasets, you start to worry about memory. dict.items returns all the items of a dictionary as a brand new list. If your dictionary is big, this can be very wasteful. dict.iteritems returns an iterator over the items of your dictionary. Combined with list comprehensions, this can be a memory-efficient way to work with your data. 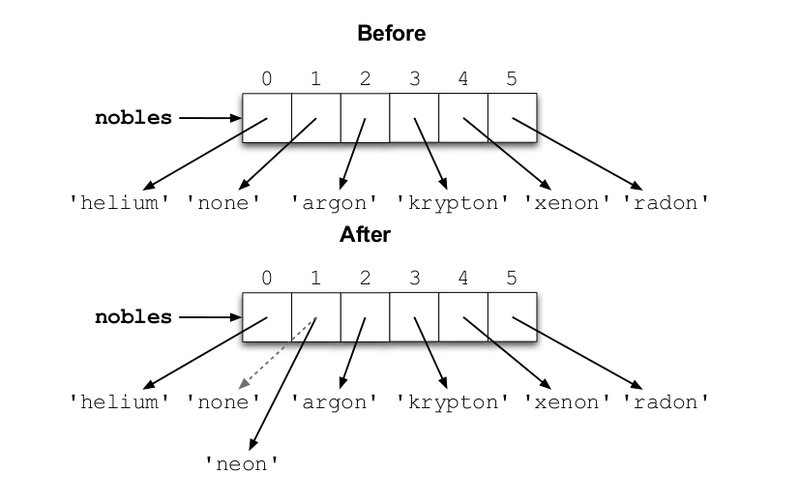 In Python 3, iteritems is gone and items now returns an iterator. If you want a true clone, you can use list(d.items()). Generators take iterators one step further by allowing them to be easily written and lazily evaluated. But calling infinity doesn't yield them all at once. It gives you a generator object, which is an iterator that will return the values specified in the yield expression! Auto-generates the __iter__() and next() methods. Saves application state up to the yield keyword. Raises StopIteration when the generator terminates. In combination, these features make it easy to create iterators with no more effort than writing a regular function. You can think of the yield keyword similarly to the return keyword, but with a twist. The function containing the yield is replaced with one that simply returns a generator. The generator only executes your function upon first call of the .next() method. The function runs until it reaches a yield, and when it does, it yields the value and returns it from .next(). But then, execution stops. Coroutines are a more exotic form of generator built by using the yield keyword as an expression rather than as a statement, e.g. So, how do we use one of these things? Yes, exotic, but great for setting up efficient data pipelines. Remember range from prior exercises/slides? Well, it has a little brother. His name is xrange. xrange yields values in a range, rather than preallocating a big list for it. Similarly to iteritems/items, xrange is removed in Py3 and range operates this way by default. Similarly to list comprehensions / iterator expressions, generators have a declarative form. Our listcomps allocate a new list and populate it with all the values specified in your listcomp expression. Meanwhile, genexps create a generator object. If output is only needed as an input for a function expecting a sequence, you should prefer genexps. They will keep memory stable. If you need to mutate the list (delete or append elements), you need to stick with listcomps. Most expressions of form fn([listcomp]) and be rewritten fn(genexp) safely. Start with a list of 100,000 numbers. Is Python an object-oriented language? 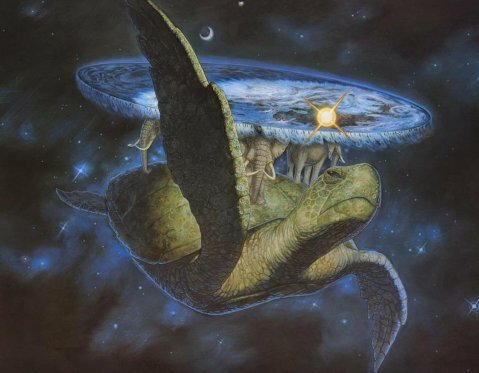 Perhaps programming paradigms aren't paradigms, but just states of mind. If you are writing a math utility library, functions may be the best organizing principle. If you are writing a database-oriented business application, perhaps classes and objects are appropriate. If you are writing a framework that is meant to be both used and extended, maybe some combination of both is in order. The standard library shows the flexibility in action. urllib is basically a set of utility functions for dealing with URLs. But it can be extended by looking into urllib.FancyURLopener. pprint and pformat are handy functions for pretty-printing. But if you need more, your can extend pprint.PrettyPrinter. Probably the handiest single line of Python, ever. Let's take a look at it interactively at the prompt. 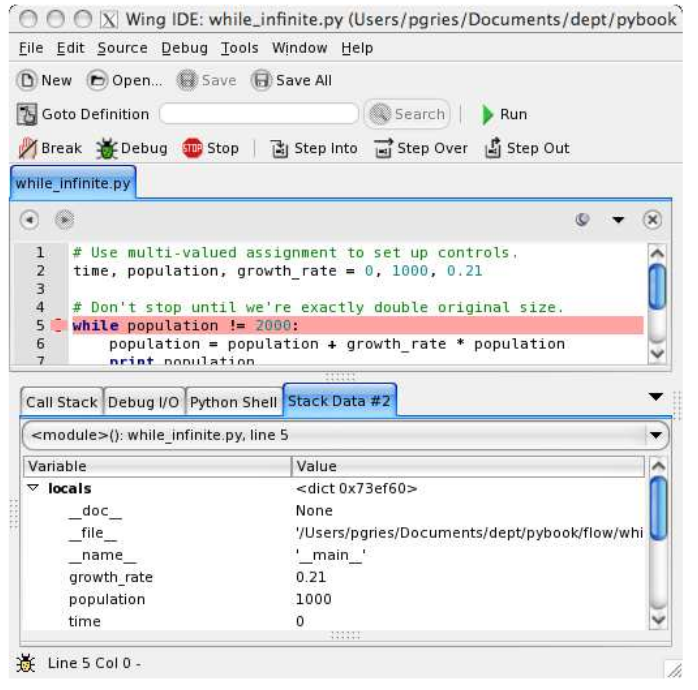 Tools like WingIDE provide a richer debugger. Debuggers allow you to navigate the callstack, which is useful for untangling complex, abstracted code. No matter how x-platform Python is, it seems we always end up having to deal with the quirks of our OS. Just like modules, classes create a new namespace. But they also have special handling for class attributes. Every class object is a function which, when called, creates an instance of the class. There is no new keyword. This is certainly a simple class, but doesn't do much for us. Roughly interchangeable with using a dict, except don't need to use string literals to get access to named values. Every function declared inside a class body is known as a method, which is automatically bound to an instance of the class at initialization time. Inside a bound method, the first argument, typically named self, contains the instance of the object in question. Guido van Rossum, Python's creator, has provided a slew of detail about his choice to require that all methods declared on a class receive a first argument that is the instance of the class. Many programmers find this annoying, and wish they could work around it. I'm one of those programmers. But I'm here to tell you, in practice, you just get used to it and it ain't so bad. But it's probably just a crutch. Any non-function attributes are considered "class attributes", and are not treated in any special way. Note these are shared for all instances of the class, somewhat similarly to static properties in other languages. Any attributes added to the instance directly using self.attr = val are considered "instance attributes". Sometimes, you'll hear Pythonistas refer to the class dictionary and the instance dictionary. That's because, under the hood, Python classes are basically fancy dictionaries. How does attribute lookup work? Attribute lookup is implemented by a special internal method called __getattribute__, which checks the instance __dict__ first, then the class __dict__, and then walks up the class inheritance chain, until it finds a hit or raises AttributeError. Magic can also happen due to a dunder method called __getattr__. And further magic can happen due to something called descriptors. At its core, a class is simply a class definition and typically, an initialization sequence implemented by __init__. Instances of that class can act either as data containers or, more typically, bundles of state and behavior. Whereas __init__ controls object initialization, __new__ runs earlier to control object creation. It is much rarer to use new. One use-case is to cache class instances (re-use classes if they have been constructed from equal arguments and are stateless). Another is to implement singletons, though typically this is a bad idea. 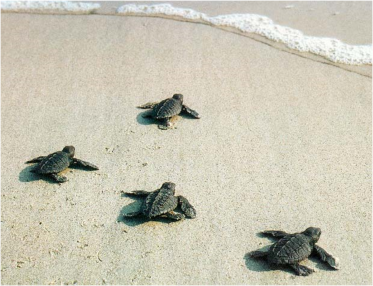 I tend to stay away from __new__ most of the time. Classes can let you design object-oriented interfaces that are intuitive for business people to grasp. A tokenizer is an object that converts text strings into tokens using some sort of tokenization algorithm. Let's do a live coding session where we build our own library of text tokenizers. We'll then also compare them to tokenizers we can find on the web, and talk about filters and stemmers, as well. Your exercise is to define an interface for Tokenizer, and then implement a couple of tokenizers against that interface, such as a whitespace tokenizer, one that recognizes punctuation, etc. group by the "feature" column and sum those values, to generate a third column, "sum by feature"
labels and whose values are the column values.""" How do I decide between a function and a class? Only take on as much complexity as you actually need! 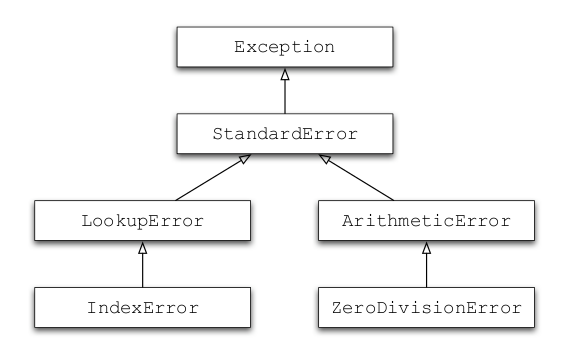 The Python exception heirarchy is easy to grasp, and a good example of a class-based type heirarchy. Handling exceptions involves thinking about alternative control flows. Generates solvable and unsolvable anagram puzzles. Exposes this API as both a command-line interface and an interactive interface. Is written as a Python module that can be imported by other code. Is written in object oriented and functional styles so that components can be reused. Python's object orientation capabilities are truly top-notch. We'll explore some ways how in this section. Alias instances are descriptors, objects that can be used as a kind of "attribute guardian". These are used often in frameworks, e.g. Django's CharField and IntField types. Called unconditionally to implement attribute accesses for instances of the class. If the class also defines __getattr__(), the latter will not be called unless __getattribute__() either calls it explicitly or raises an AttributeError. This method should return the (computed) attribute value or raise an AttributeError exception. In old-style classes, this was the only way to control attribute access. Nowadays, it's reserved only for "magic" objects, proxies, and frameworks. Build a set of classes that represents the data in this diagram. Let's take a quick whirlwind tour through some of my favorite stdlib modules. user.password = "not a chance"
Build a module that makes an HTTP request to Wikipedia for any given article page, e.g. Barack Obama. What it returns back is the number of occurrences of a string in the article page. Use urllib and urllib2 to actually perform the HTTP request. Use a defaultdict to count the number of occurrences of the search term. Use the re module to search for the string in each line of the response page. Use doctest to make sure everything is working properly.